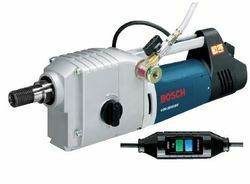 Offering you a complete choice of products which include bosch professional diamond concrete cutter. Tool Holder R 1/2", 1 1/4"
Keeping the track of latest development in this domain, we have been able to supply, wholesale and trade the optimum quality of Bosch Professional Diamond Concrete Cutter. Rendered by us in various specifications, the offered diamond core drill is used for drilling purposes. Motivated to attain maximum customer approval, we deliver the offered defect-free range of diamond core drills at the clients’ end.